Bob's involvement in experiential learning began in 1981, when Experiential Training was first being introduced to the Australian corporate world. At that time, he was struck by the incredible potential that outdoor experiential training has to offer in the lives of participants, and to their effectiveness within their companies. Bob established Outdoor Insights in 1990 and has maintained an active "hands-on" role as a trainer while developing new training programs to meet the changing needs of business clients. Bob is an accredited facilitator with TMS Team Management Profile, QO2, Windows on Work Values as well as DiSC. 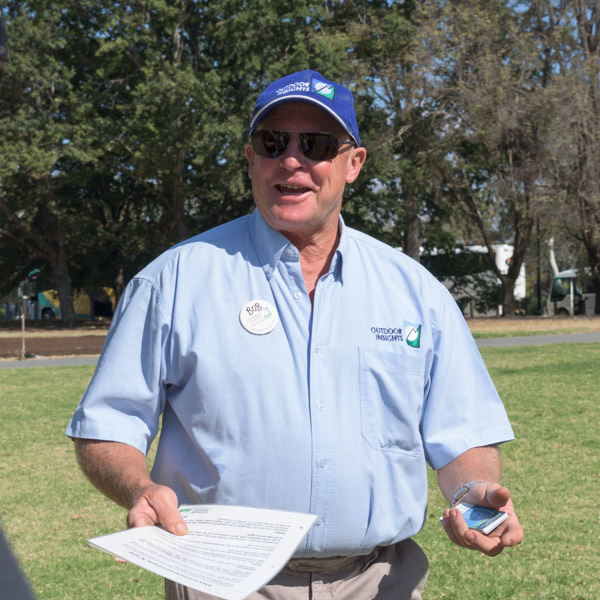 He has also completed Training to Train with Stephanie Burns, Cert IV Outdoor Adventure Activities, Situational Leadership II and is a certified Workplace Trainer and Assessor. Bob is proud of the team he has been able to attract to Outdoor Insights, with a broad range of training expertise. Bob has extensive climbing and mountaineering experience from around the world including five expeditions to 8000m peaks in Nepal and Tibet. In 2001 Bob was Expedition Manager of the successful Australian Army Alpine Expedition to climb Mount Everest and returned to reach the summit himself in 2006. Warren has 30 years of experience in training organisations across both private and public school systems and in the TAFE and University sectors. As a Consultant and Facilitator since 2000, he has worked in a range of business sectors including aeronautics, mining, financial, defence, manufacturing, hospitality and health. Warren's initial employment was as an Architectural draftsman and Clerk of Works during the hectic building boom of the 1980's. He then trained as an Industrial Arts Teacher and worked as an Instructor for the Australian Outward Bound School before working in the Juvenile Justice System. He then became the Director of Outdoor Education for Knox Grammar School. Warren now works extensively in leadership development, team development and business improvement. Warren is passionate about experienced-based learning, which he sees as the most effective way to facilitate lasting change in individuals and organisations. Warren has a Masters Degree in Educational Administration, a Bachelor of Arts and Diploma of Teaching, as well as being a Workplace Trainer and Assessor with Team Management Profile (TMP) and Life Styles Inventory (LSI) accreditation. Warren spends his spare time competing in marathon kayak events, recreational cross country skiing, mountain bike riding, bushwalking and is a member of his local musical society. Zac joined the Outdoor Insights management team following a distinguished military career spanning 31 years. A graduate of the Royal Military College Duntroon, Zac has been at the forefront in the development of experiential learning and adventure activities as a means of developing junior leaders within the Australian Defence Force. For his distinguished leadership in this area, he was awarded the Conspicuous Service Medal in the 1998 Australia Day Honours list. Zac brings a wealth of small team leadership experience through his work over four years at the Australian Defence Force Academy in Canberra and numerous military assignments leading small diverse teams including UN operational service in Kashmir with 8 other nations. He demonstrates a remarkable passion for mountaineering where through his leadership of many expeditions to the Himalaya, including the successful Centenary of Federation 2001 Everest Expedition. Zac returned to complete the summit himself in 2008. Zac is a regular keynote speaker at Corporate Seminars and his presentation titled "Leadership in Adversity" is widely acclaimed as a case study for leaders and potential leaders. His qualifications include a Masters degree in Instructional Systems Design from Florida State University. Zac's tertiary education brings to Outdoor Insights an ability to conduct Training Needs Analysis as well as the capability to design, develop and evaluate training programs tailored to the specific needs of clients. Zac is an accredited facilitator with TMS Team Management Profile, QO2, Windows on Work Values as well as Myers-Briggs Type Indicator and DiSC.